Back row, L-R: Mia Williams, Alondra Yanez, Shannon Cox, Gil Campos, Elias Heinsch, Bryce Baldwin, Max Erickson, Gustavo Inzunza, Pam Bold. Front row, L-R: Nicole Suarez, Samantha Bonich, Vida Vasquez, Lucy Martyr, Jack Leonard, Mario Gutierrez. With some of the best tap water in the world coming out of the faucets in Mammoth Lakes, it’s puzzling for locals to see visitors streaming out of Vons with pallets of bottled water beneath their shopping carts. 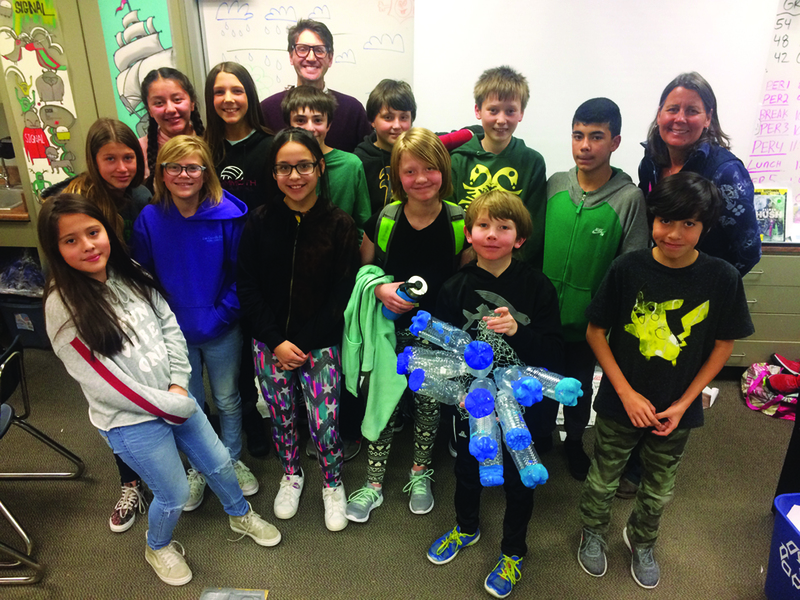 A group of Mammoth Middle School students are trying to raise awareness about the overuse of plastic water bottles, and their efforts may even help them win money for their school. The kids are taking part in the project under the tutelage of sixth grade science teacher Gil Campos, where they use his comic book character-festooned classroom as base camp for the outreach they’re doing. In the past several weeks, the students have spoken to the Mammoth Lakes Rotary Club and performed a blind taste-test for the Mammoth Town Council in an attempt to encourage people, especially visitors, to drink tap water.